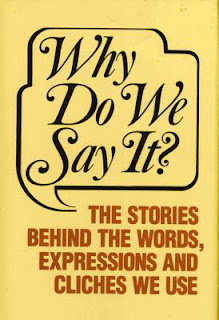 Being a lover of words, I've often wondered about the origins of certain terms and expressions I've heard throughout my life, and for years I'd sought out books that expounded on them. Bon mots, adages, idioms, that sort of stuff has intrigued me for as long as I can recall. This book is the closest I've come to that kind of thing. In this book, we find quite a few curious, sometimes amusing, tales about how some of these words and sayings allegedly came about. Some expressions, such as 'Learn By Heart' (or as I've often heard it said, 'I know it by heart'), as well as 'Learn by Rote' date back to antiquity. Others, such as 'quiz,' and 'Flash in the Pan,' are only a few hundred years old. Some terms and expressions are corruptions of their original, such as 'Nuts in May,' which was initially 'knots in May' as in 'sprigs of flowers,' which do come out in May. A few I knew: Carry Coals to Newcastle, Doubting Thomas, Drink Like a Fish, Baker's Dozen, C.O.D., Gordian Knot, Supercilious. Others I didn't know: Uncle Sam, Two Bits, Upbraid, Lavender, Honeymoon. Others I'd never heard before: In the Swim, Heater Piece, Fit in the Arm, Badge of Poverty. Tip. What is the reason we call a gratuity a “tip”? Years ago in English inns and taverns it was customary for the patrons to drop a coin for the benefit of waiters into a box placed on the walls. On the box was a little sign which said: “To insure promptness.” Later just the initials of the phrase were put on the box – T.I.P. Stool Pigeon. Where did the “stool pigeon” get that name? Don't ask us; just tell us. I realize the purpose of first listing the word or expression is to aid in the alphabetization of the entries. But in the above cases, as well as in hundreds of others, the questions that follow aren't necessary. That might seem like a small thing, but hundreds of entries each followed by a redundant eight to fifteen word question means thousands of superfluous words throughout the course of the book. Reminds me of the redundancy found at a spelling bee.